Recently, numerous non- PC-dependent devices have been launched to tempt the mass-market to internet telephony. But while a few of these, such as Draytel's VigorTalk, have enjoyed success so far, VoIP still remains the domain of the PC-literate. 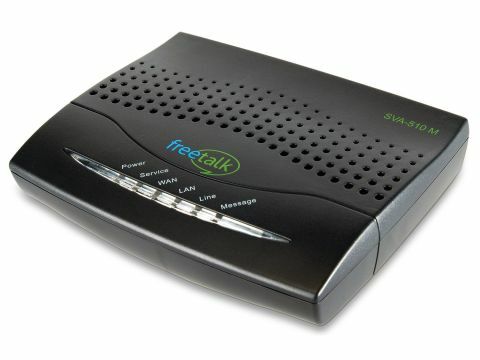 FreeTalk hopes to change this with this compact VoIP box, which connects to your router via an Ethernet cable. It's compatible with any standard phone, too. In fact, barring the necessity to register a FreeTalk account online, you don't even need a PC. Once registered, you're granted a year of unlimited local and national calls. What's more, FreeTalk assigns you with a common landline number, which anyone can call you on at the standard UK rate. The twist here is that your home number and area code are assigned to the FreeTalk box, and not your PC, meaning you're contactable on the same number, and at the same rate, whether you're in Bognor or Bali. FreeTalk isn't technically free however, and loses out significantly to Skype in the value-for-money stakes. While internet calls to any PC are free, popular destinations such as the US are 2p per minute, and India will set any prospective natterers back a princely 11p a minute - marginally more expensive than SkypeOut, but far easier to negotiate. What makes the FreeTalk a success is the realisation that firing up a PC just to make a phone call is a real pain. Here, VoIP calling is as it should be - easy to use, cheap and as straightforward as using a normal landline phone.